The last few weeks of the year are always strange. You get an odd mix of excitement for the festive break combined with the uncomfortable knowledge that those things you promised to get done by the end of 2015 haven’t even been started yet. And every agency is consumed by an underlying fear of a last minute pitch coming in that wipes out the period between Christmas and New Year, or, even worse, the Christmas party. It also marks the time for various yearly reviews and awards, where you can take a couple of hours to indulge in the very best work that the past 12 months has conjured up. This site has already done a great run down of the best of the UK industry, and George Parker has given a hilarious analysis of the year in US advertising. So I’m hoping to plug the gaps by handing out a few international awards of my own. It won’t be as insightful as Stephen’s look at UK agencies, and it won’t be as foul-mouthed as George’s American take. And you certainly won’t find these award categories at Cannes. But let’s take a quick trip down memory lane, and look at a few of the global industry’s best and worst moments of the past twelve months. Let’s start with a hotly contested category. Because let’s face it, this phrase could be used to define so many moments in the year. The Volkswagen debacle. That bloody Head & Shoulders ad. Calling an agency Truffle Pig. But I’m going to pick something that was more of a frustrating ‘missed opportunity.’ In August, Burger King gave McDonald’s a challenge – how about combining efforts to create the McWhopper, to help raise awareness of World Peace Day? A shameless PR tactic? Yes. An idea nicked from a student’s book? Perhaps. But an effective idea it was. It excited burger fans everywhere and was promoted through a beautifully designed website. McDonald’s response? This short, spoilsport Facebook post. Of course by making the first move Burger King always held the upper hand, but here was a great opportunity for McDonald’s to react in a genuinely fun and creative way. We should have been talking positively about this for months. We weren’t. 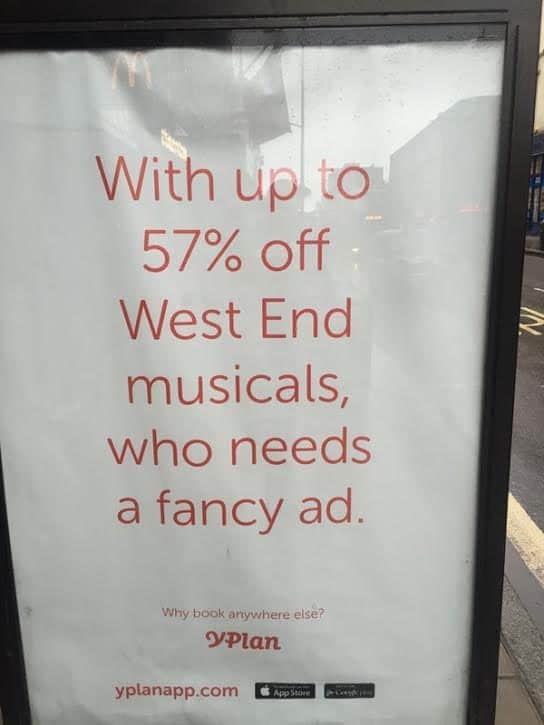 They may not think they need a fancy ad (although I’d wager they might – even after sifting through a lot of this campaign, I still have no idea what they do) but YPlan definitely needs a question mark. Kudos to Lucky General’s Andy Nairn for pointing the finger – and he’s been joined by an army of enraged Twitter pedants (lesson one: NEVER piss off an army of Twitter pedants). Indeed, it’s gone as far now as people actually roaming London with biros trying to correct the ads. Why, YPlan, just why? After the YPlan monstrosity, let’s have an award to remind us that great copy isn’t actually consigned to the doldrums. You know all about the Grey London turnaround, but let’s give them more plaudits still for these wonderful ads for Tate Britain. Bold, powerful and smartly written. Long copy ads aren’t a distant memory just yet. And here’s another one. Age UK’s ‘No one should have no one’ campaign (below) included some brilliantly written outdoor ads. So much so that they’ve stuck in my mind ever since seeing them at the beginning of the year. Of course, Age UK has since teamed up with John Lewis and the ad has been updated with a Christmas version, The art direction has suffered a little as a result, but the copy is still great. It’s lovely to see some clients still recognising the power of language. So copy isn’t dead. And nor, 2015 has proved, is radio. Every year we debate the power of radio, dismiss it as the brief you give to the intern team, and every year agencies (particularly in South America) come up with novel ways to prove that it can actually be one of the most creative channels going. I loved this work from Brazil earlier this year, which saw an insurance brand help to combat a genuine problem – that Brazilians can’t park properly – by devising makeshift parking sensors that are streamed through a car’s radio system. A smart way of telling a simple brand message. Remember when people used to send letters? They were crazy times, right? Actually, the proliferation of spam emails and increasingly rare sightings of your local postie has made receiving a letter nowadays a very powerful thing. The Royal Mail have been championing the cause smartly all year, and they’ve been joined in campaigning by their Dutch counterparts, who came up with a very nice PR initiative for Valentine’s Day, allowing people to substitute a stamp for a kiss. It’s a small, sweet idea, but my hunch is that, with a decent case study film, it’ll win the juror’s hearts at awards next year. It’s exactly the type of stunt that goes down well and is bang on brand. We all love a big, brash, brand campaign. But some of the most viral pieces of content from the past few years have really been glorified product demonstrations. This peaked last year with the Jean Claude Van Damme ‘Epic Split’ campaign for Volvo Trucks, which garnered an astonishing number of views for what is essentially a b2b ad displaying the handling of Volvo’s heavy goods vehicles. For 2015’s Epic Split, how about this spot for Japanese cosmetics brand Shiseido? Their make-up is so convincing that it can even turn boys into girls. It’s incredibly well crafted and put together in a way that only becomes more powerful the more you watch it. Another spot that takes a product demonstration to the extreme and showcases it in a mesmerising way. 37 Days was created by Leo Burnett’s Paris office, and showcased electric heaters by taking them to one of the coldest places on earth and using them to generate life. Not just in a ‘here’s a semblance of a plant’ way; in a ‘bloody hell this looks amazing’ way. No wonder AdWeek featured this, and the aforementioned Shiseido campaigns, in their favourite ideas of 2015. If the Atlantic Group ‘growing a garden in -30 degrees’ work isn’t geeky enough for you, then here are a couple that might be. I wanted to feature them for two reasons – first, being geeky is suddenly very cool again, and second, they’re both examples of some of my favourite content campaigns of 2015. And with a job title as ridiculous as mine it’d be remiss of me to not shoehorn them in somewhere. General Electric wanted to showcase the industrial internet and inspire more developers. So they created ‘Pivot’, an experimental podcast that’s been described as ‘Serial for coders.’ If you don’t know what Serial is, then stop reading this and download it from iTunes NOW. If you do, then you’ll probably be intrigued by Pivot. Take a look here. It’s a very brave and very exciting piece of content marketing. I love it. The next stop in our global tour of countries that always seem to do better than us at Cannes is Sweden. In October, pension company SPP produced this clever interactive video that allows you to flick between two versions of the future: one utopian and one dystopian. The reason? To show how different the world may be if we don’t save sustainably. It’s a bit like the Honda ‘Other Side’ campaign, but makes a much more important point. Staying on the sustainable theme, here’s an award that ties in adland’s apparent mission to solve all the world’s problems, one interactive site at a time. Of course most of these ideas don’t make it further than a couple of well-intentioned creatives and a nice case study film. But that doesn’t mean they aren’t great, ambitious ideas, and it certainly doesn’t mean they won’t smash it at Cannes next summer. Here’s one that sums up just that. A nice idea from Ogilvy & Mather Hong Kong, which looks to clean up the city’s street through public shaming. A team takes samples from litter dropped on the street, and uses the DNA to render the faces of those who dropped the trash. Feasible on a big scale? Nope. But a clever concept, and one that generated huge PR not just in Hong Kong, but all around the world. Boy, Ogilvy are good at these social experiment stunts. Going from Hong Kong to Panama, here’s a lovely idea that aims to pester the Panama City’s government into taking action over the sheer number of potholes in the under-developed streets. A device containing pressure sensors would automatically tweet the Ministry of Public Works Twitter account every time a car runs over one. The pothole Twitter accounts were fun, creative and actually worked – the PR generated from the campaign prompted the government into action. Good job. A small category this, because we all know that to create a decent Christmas ad these days you need to make the viewer break down in floods of tears – or at the very least be championing a worthwhile cause. But it can be done and let’s turn to an old favourite to do so. I’ve talked excitedly about BETC Paris’ work for Canal+ before – the ‘Closet’ and ‘Bear’ ads are some of the best of the last decade – and their Christmas ad this year is pleasingly brilliant as well. It’s fun, chaotic and at times very, very funny. If nothing else, it’ll be the best ad starring a warthog you’ll see all year. I don’t want to be another person sticking the boot into John Lewis’ Man on the Moon. It’s a nice ad. Not up to the usual high standards they set but still better than 99 per cent of TV advertising out there. But whilst John Lewis and its UK counterparts are trying to outdo each other on the tear count this festive season, here’s a Spanish ad that’s come along and completely destroyed the competition. The Pixar-inspired spot is emotive, unexpected, beautifully crafted and warms the heart in a way that’ll last right through 2016. It’s not just my favourite Christmas ad; it’s my favourite ad of the year.